Our neighbourhood recently got the addition of not one, but two new grocery stores. Both opened in early August, and they are located a mere 800 meters from each other! What a treat for foodies. I just snooped around Les 5 saisons for the first time yesterday. It’s a high-end store where you can expect to find expensive fine foods, Fauchon desserts, and where everything is very neatly stacked, even the bags of ice. Doing everyday shopping there would prove pricey. The second store is Adonis, a middle eastern / mediterranean supermarket with exotic foods at a reasonable price. I found kashkaval, taramosalata, pomegranate syrup and big tubs of tahini for cheap. Given that these items are either nonexistent or very pricey in regular grocery stores, I am thrilled. The best part? Both stores are just a short bike ride away. P.S. 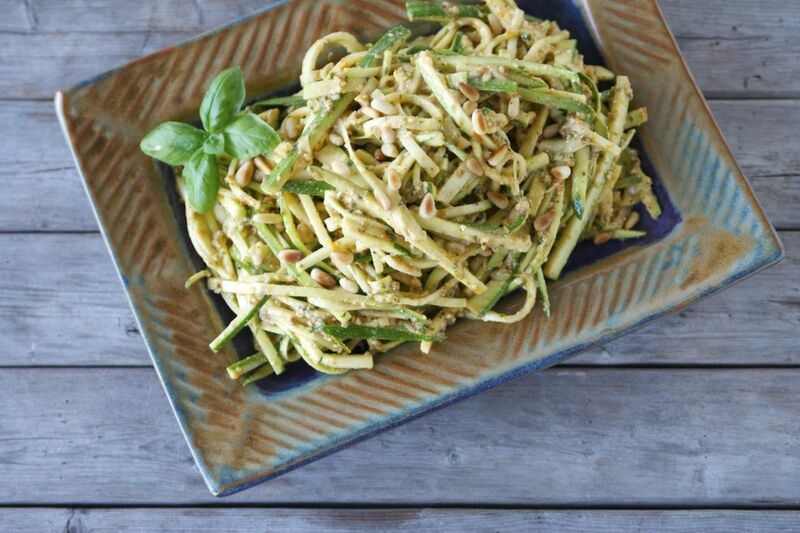 I should probably tell you that this raw zucchini salad (or zucchini “pasta” – call it whatever you like) is to die for. P.P.S. For more salad recipes, click here. 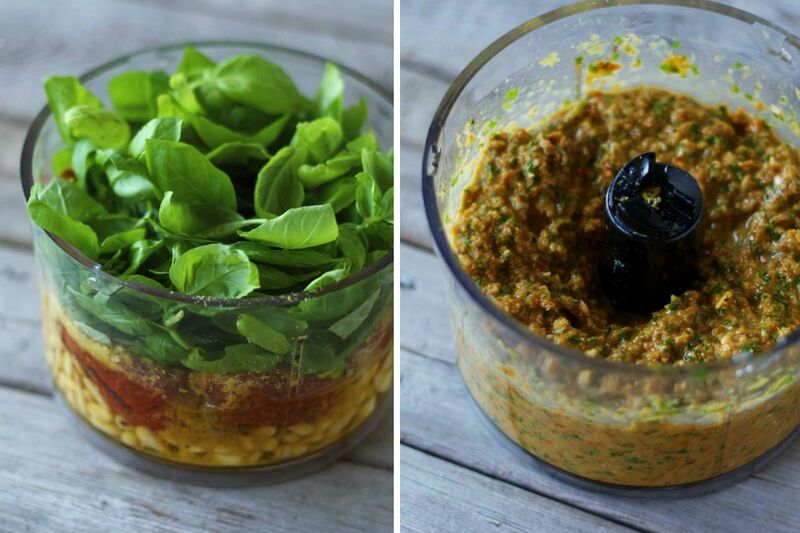 For the pesto: In a food processor, combine the basil, sun-dried tomatoes, oil, 1/2 cup of pine nuts, nutritional yeast, garlic cloves and process until smooth. Taste and season with salt & pepper. Set aside. 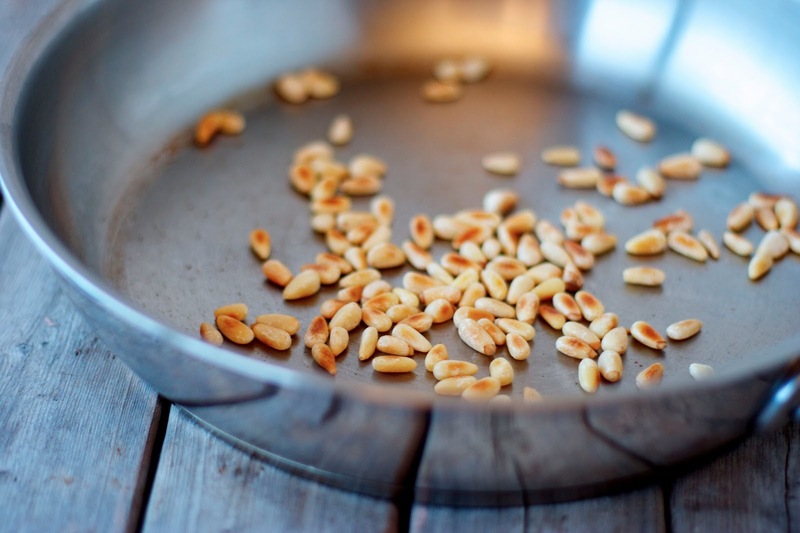 To toast pine nuts, heat a skillet over medium heat until warm. Add 1 tbsp of pine nuts and toast, stirring constantly for 3-4 minutes until they are aromatic and a bit darker in colour. Set aside. 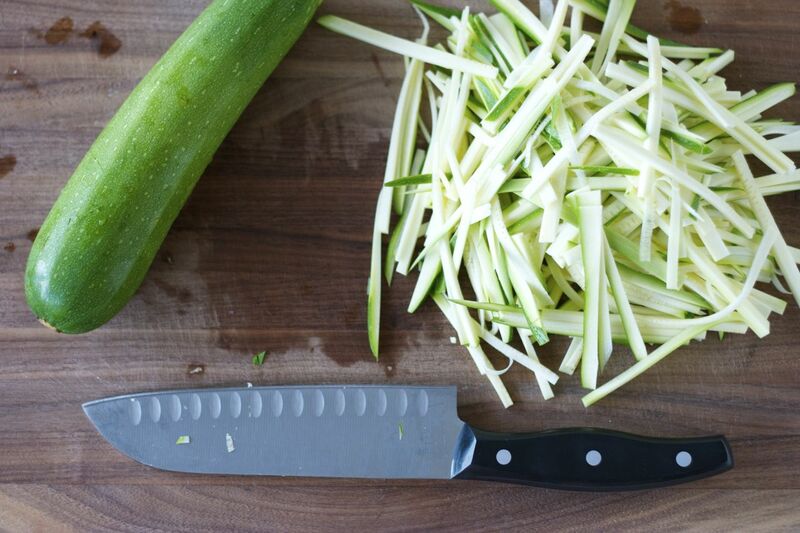 Slice the zucchini into matchsticks / julienne cut. I used a knife, but feel free to use a julienne peeler, or a mandolin. 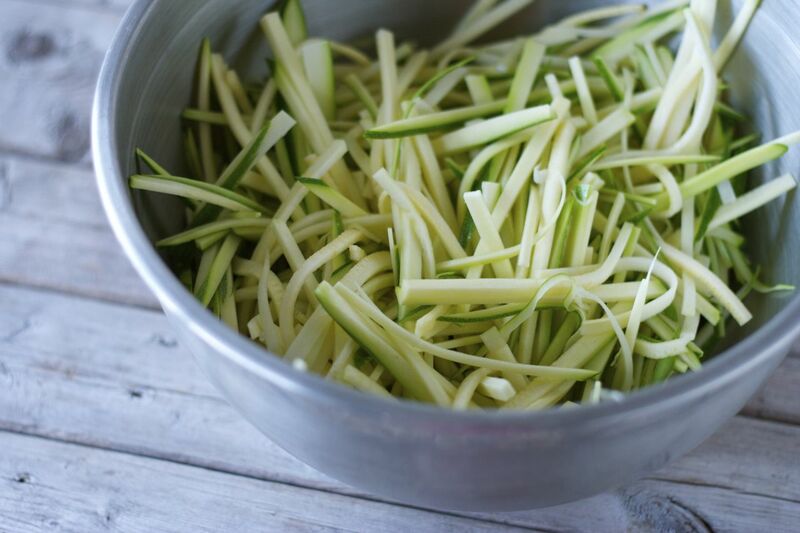 Place the julienned zucchini in a large bowl. Add about half of the sun-dried tomato pesto to the zucchini. Toss to combine. Add more pesto to obtain the desired coating. I used approximately 2/3 of the pesto for my salad. Use the leftover pesto as you wish. 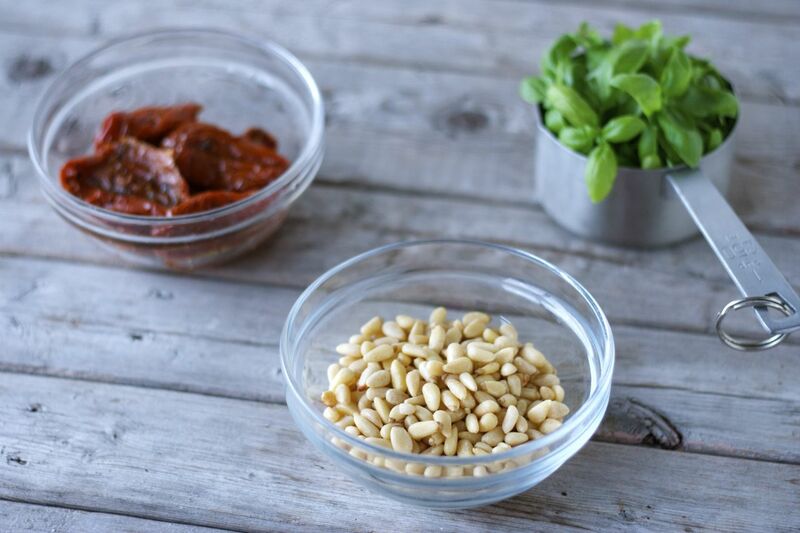 Serve immediately, topped with toasted pine nuts and a sprig of fresh basil. Devour! Serves 4 as a first course / side dish.